On Sunday 11th November, the award-winning Theatr na nÓg (TOM, Eye of the Storm) present a tale of family, love and loss as a young Swansea boy is called to the frontline. 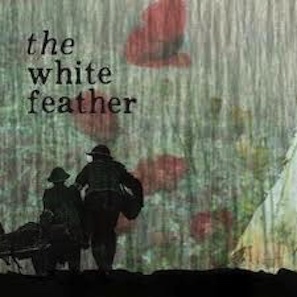 Following a young Swansea boy’s dream of wartime adventure and the harsh realities he encounters, The White Feather is a captivating retelling of the famous battle of Mametz Wood in war-torn northern France, where nearly 4000 Welshmen were killed or injured in 1916. Written by Keiron Self and directed by Geinor Styles, the play commemorates the end of WWI and the Centenary of the Women’s Vote, delving into how these momentous events and the rise of the suffragette movement affected families in South Wales. Interweaving narrative with live musicianship the cast of talented actor-musos includes Huw Blainey, (Sherman and New Vic Theatres’ stage adaptations of The Borrowers; Theatr na nÓg’s Eye of the Storm), Keiran Bailey (Theatr na nÓg’s past productions Tom and Eye of The Storm, Charlotte Church and Jamie Smith’s Mabon), and fresh talent from Camarthenshire born Lara Lewis, recently graduated from the Guilford School of Acting. The fourth cast member, Geraint Rhys Edwards, has has worked on film, TV and stage across the country, was winner of the Dorothy L Sayers Award for best newcomer and has recently received a swathe of press attention after a video of his Love Island star impressions went viral. The public performances will take place at Swansea’s Dylan Thomas Theatre, and follow a 10 week residency there during which nearly 100 South Wales schools will be visiting to experience the magic of this live performance, meet the cast and creative team and take part in immersive WWI workshops in partnership with Swansea Museum, The National Waterfront Museum and innovative coding educators Technocamps. A young boy dreams of escaping the humdrum reality of life in Swansea as WWI rages. Signing up for the excitement of war, Davey leaves behind friends, family, his shell-shocked elder brother Rhys and frustrated sister Rose. One fateful July night war rages around him and his life passes before his eyes as he sits stranded in a muddy bomb crater. Multi award-winning company Theatr na nÓg mix the heartbreaking realities of warfare with moments of magic and hope, beguiling First World War poetry and rousing live musicianship. Tickets for the public Remembrance Sunday performances are available now from dylanthomastheatre.org.uk or by calling 01792 473238.